How brand loyal are users to iPhone and Android? Research from Nielsen Online suggests that Twitter might have problems with ‘stickiness’ – with retaining users that give it a try. 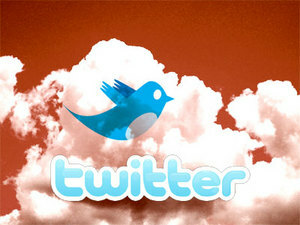 Its statistics suggest that more than 60% of Twitter users fail to return a month of using it. In fact for most of the past twelve months, Twitter has had difficulty keeping more than 30% of its users after a month, though the entry of Oprah Winfrey has helped. 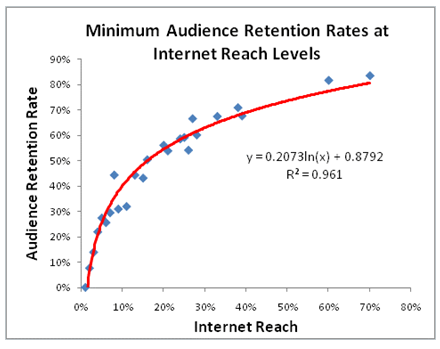 Facebook and MySpace, before their explosive growth periods, had nearly double the retention rates that Twitter currently faces. What would be interesting to see would be how many people come back later on. It’s been my experience of the site that people sign up and bag their name, then ignore it until lots of their friends are using it, at which time they return. Still, it’s worrying news for the site which needs to start crossing over sooner, rather than later. Intense media coverage in the UK has helped, but it’s still not obvious to many new Tweeters how the site works, or its Twittiquette. Today at some stage, Facebook will hit 200 million users – nearly 3% of the world’s population. It’s another massive milestone for the service, which only hit 150 million back in January. The news means that it leapfrogs Brazil to become – if it were a country – the fifth most populous country in the world. The news has prompted boss Mark Zuckerberg to make a blog post, asking what 200 million means to you. 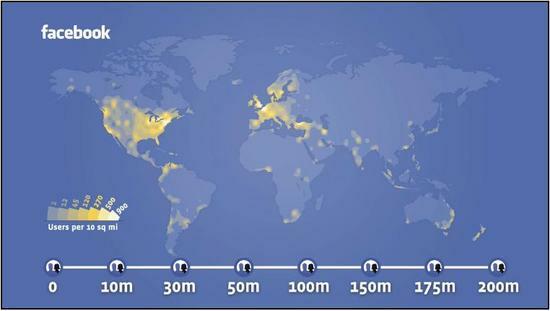 A video’s been put together, too, which you can see here, featuring a heatmap that shows where Facebook is most accessed – proving fairly conclusively that it’s still an exclusively western phenomenon. If you’re interested in more about Facebook, then have a read of my article the other day which discussed why we shouldn’t forget about Facebook in all our excitement over Twitter and Spotify. Stats from Comscore have revealed that 75% of UK iPhone users access their email on their phone – more than double the average for smartphones. The news kicks dirt in the eyes of critics who don’t like the onscreen keyboard. 60% of iPhone users accessed news on their device, compared to 15% for mobile phone users, and 37% of iPhoners have downloaded a game, compared to just 5.6% of regular smartphone owners. Lastly, some demographics. 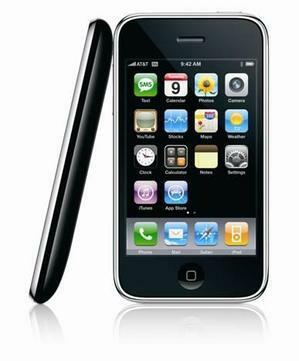 75% of iPhone owners are male, and most are between 18 and 44. That’s not too different to other smartphone owners, 65% of whom are male. Comscore cautions those who are calling it the next big thing, though – only 2% of British mobile phone owners have an iPhone. O2 has just released a statement on its Digital News Centre announcing that more than a million iPhones have now been sold in the UK. I can attest to that personally, I was in a pub the other day, and the three other table inhabitants ALL had iPhones. I would have felt left out if I didn’t love my N95 so much. The company’s also announced that it’s signed up 1.1 million new customers over the last year, with 390,000 of those joining O2 between Oct and Dec 08. That’s a lot. Good work, O2. Twitter’s popularity in the UK has exploded since January, after a number of high-profile celebrity Twitterers including @stephenfry, @wossy and @schofe started using it, and talking about it. As a result, the site’s traffic has trebled since ths start of the year, according to Hitwise Intelligence. All that traffic has catapulted Twitter into the top 100 UK sites, where it now sits at #91, above Expedia, Gumtree and Easyjet. It’s also ranking seventh within the “Social Networking and Forums” category. Of course, this still underrates Twitter’s popularity, because many people don’t use the website to interact with the site. Real numbers would be even higher. 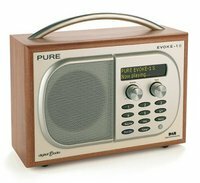 The humble DAB radio has been a fixture in middle-class households across the UK for several years now. However, it’s growth appears to be slowing. Although more than half a million sets were sold in December, that’s down nearly 10% on the previous year, and down 20% on the Digital Radio Development Bureau’s forecast for the year. At the same time, there’s no date been set for analogue radio switchoff and the growth of internet radio and compatible devices directly threatens DAB’s position as the future of radio, in the same way that Blu-ray is being threatened by digital delivery of video content. DAB either needs a strong injection of support, or to be cut free to sink or swim on its own. Its current middle-ground situation isn’t really helping anyone. Much will depend on what happens in 2009, I suspect. Do you use DAB? Could you live without it? Tell us your story in the comments.